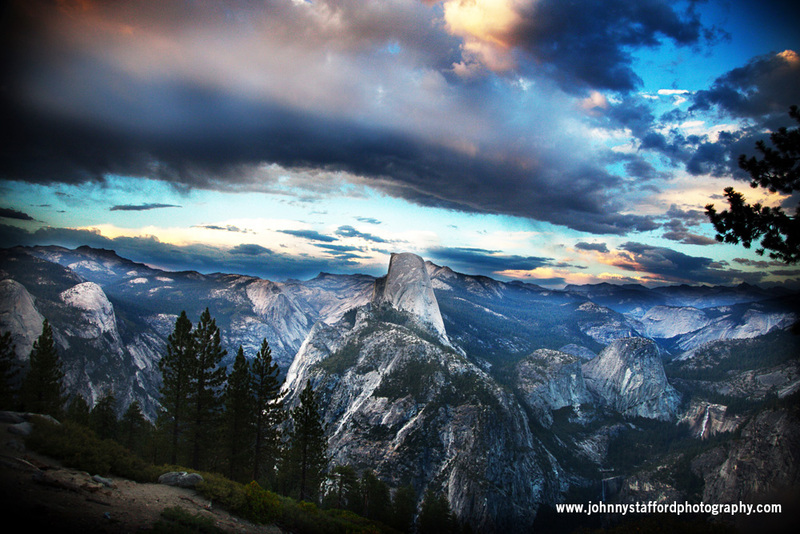 Based in central California, Johnny Stafford Photography is comprised of Johnny and Cindy Stafford, an award-winning husband-and-wife team that has been photographing weddings in Yosemite and other California destinations for over 10 years. With their wealth of experience, we decided to ask them all about photography and weddings in Yosemite. Here’s what they had to say. Our advice for couples marrying in Yosemite (especially those planning from afar) is to rely on the expertise of experienced area professionals to assist and advise on the wedding logistics and free yourself up to enjoy your day. The Delaware North professionals at every venue are excellent and go over and above to help guide couples through the event planning stages. There are also wonderful area vendors including florists, beauty stylists, planners, officiants, musicians, DJs (and your photographer, of course), who know the details about Yosemite and can help couples navigate timing, schedules and logistics within the National Park to make the day perfect and stress-free! Johnny Stafford Photography is the award-winning, husband-and-wife team of Johnny and Cindy Stafford. 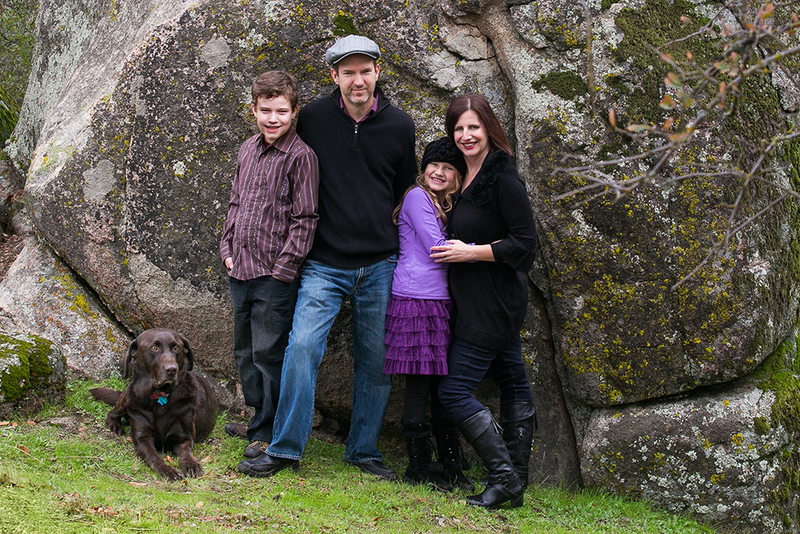 The Staffords have been photographing weddings in Yosemite and other California destinations for over 10 years. They met in college when Johnny sent Cindy a secret-admirer note. They have been together ever since… for over 20 years. Whether you get married in spring among waterfalls and wildflowers or during a spectacular white winter, a wedding in Yosemite means a beautiful backdrop for the video of your big day. 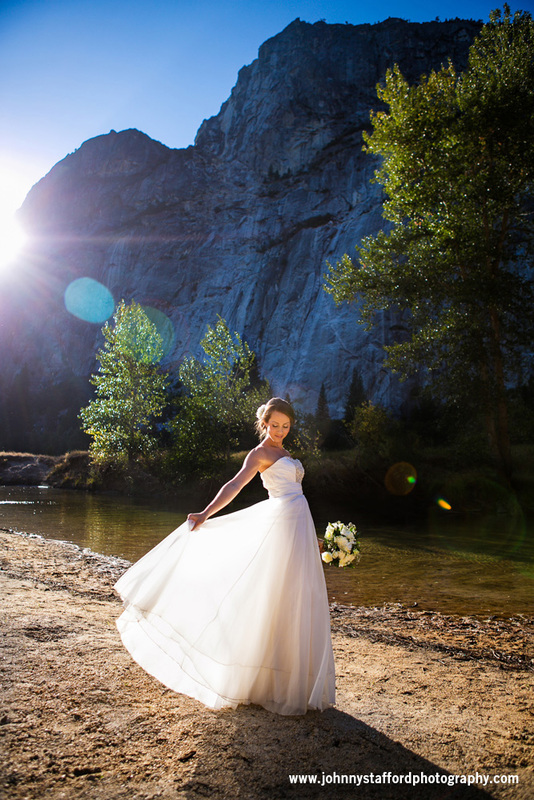 Here are some of our favorite videos from recent Yosemite weddings. 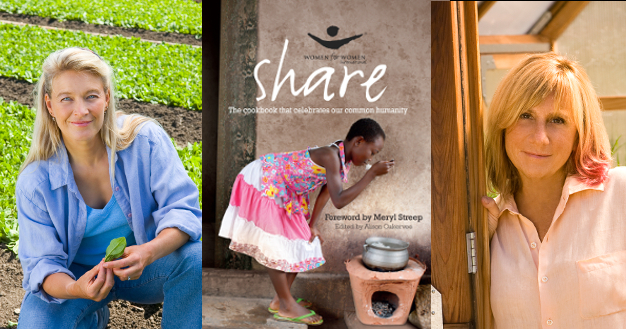 The remarkable cookbook, Share, gathers together the stories of women in war-torn countries as it explains how food connects people in each country. Interwoven within these stories are recipes from the book’s collaborators, people such as Paul McCartney, Meryl Streep, and Judi Dench. In January 2015 at Chefs’ Holidays in Yosemite, two of the book’s collaborators will be joining us – Nell Newman, daughter of Paul Newman and head of Newman’s Own Organics, and Jesse Cool of Flea Street Café in Menlo Park. We recently had the opportunity to talk with Nell and Jesse about their experiences working on this cookbook. How did you get involved with the Share cookbook? Jesse: I was approached by Lauri Pastrone, the woman who conceived the book and made Share happen through her work with a group of amazing women. Also, I have always had a draw to Africa. Most of my reading for years was about despair turned to hope and love in the midst of the worst of the worst. After meeting Lauri, I sponsored two women in Rwanda and then joined a trip with Lauri and others to go and cook in Rwanda and meet one of the women I sponsored (a few photos in the book are the women I cooked with). You can actually read the story on page 212 of Share. Nell: My dear friend Jesse Cool asked me if I had recipe to donate to this wonderful book she was helping put together to support the Women for Women International Project, which supports women in war-torn countries. What does the Share cookbook mean to you? Jesse: It means love, beauty, joy in the midst of pain and dark injustice, generosity, local and global care for women, and families in need. Nell: The Share cookbook is a perfect example of how together we can make a change; through food, education, and love for humanity. What did you learn from collaborating on this project? Jesse: I met amazingly generous women who are real and care without attachment. It took my personal and businesses beyond my decades of being a local girl to stretch out and reach out to our abundance on a more global level. It helped me and my staff attach more deeply to our own beautiful life and learn how to give to those who have less. What is your favorite recipe in the cookbook? Jesse: Well, honestly it is Nell’s olive oil cake. I make it and serve it in the summer with berries and in winter with honey crème fraiche. The first time I had it, Lauri made it for me and I had to take a few slices home to eat as a midnight snake. I love Nell, so it meant even more that it is her recipe and so good. It holds up well for days, and is so yummy. Any hints about what you’ll be preparing for Chefs’ Holidays in Yosemite this year? Jesse: In my recipe, I tried to offer something that I felt was more African in feel…that is how I came up with the pork stew. Are you excited about coming to Yosemite? Why? Jesse: My kids have always known Yosemite as their summer and winter and whenever-we-can-steal-a-day-away place to go. We say that it remains the most beautifully moving place on the plant, and I have traveled the world cooking in many amazing places. Nell: How could anyone not be excited about coming to Yosemite! I’ve only been there once before and have never seen it in its winter splendor! I can’t wait! Summer nights in a national park include the soft glow of the Milky Way rising over your campsite, a wilderness landscape lit by the full moon during an evening hike, and the twinkle of stars and planets from a roadside vista point. In California’s Sierra Nevada Mountains, Yosemite National Park is a harbor of darkness in a highly populated state, providing an excellent opportunity to truly experience the star-filled night. In addition to all the daytime hiking, biking, rafting and rock climbing under sunny Sierra skies, the summer evenings in Yosemite can be just as full of activity and wonder. With thirteen campgrounds and seven lodging options inside the park, summer nights in Yosemite can be filled with a range of activities such as dining in an historic hotel, socializing with s’mores around the campfire or contemplating the awed silence of fellow stargazers. 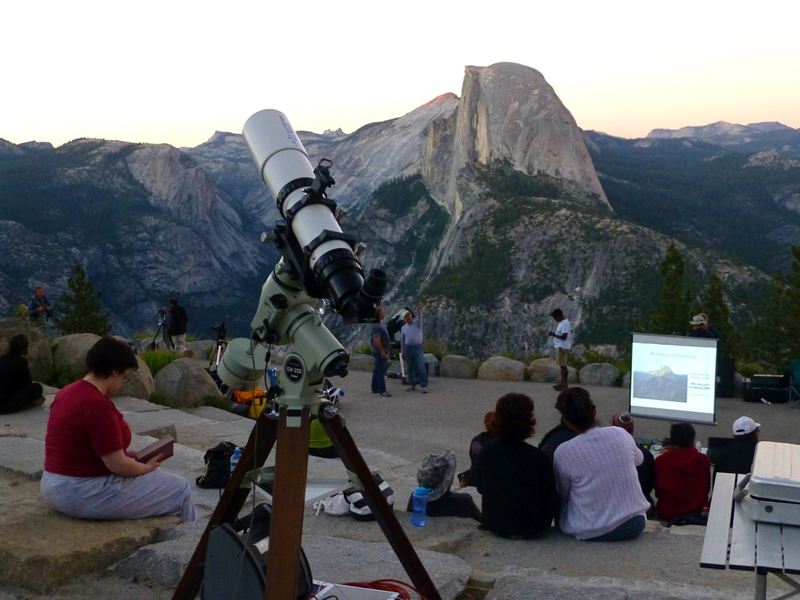 For the celestially minded, Yosemite’s park rangers give sunset talks, full moon hikes, the “Stars Over Yosemite” Program as well as hosted Star Parties at Glacier Point, and Moonlight Tours aboard the Yosemite Valley open air trams. 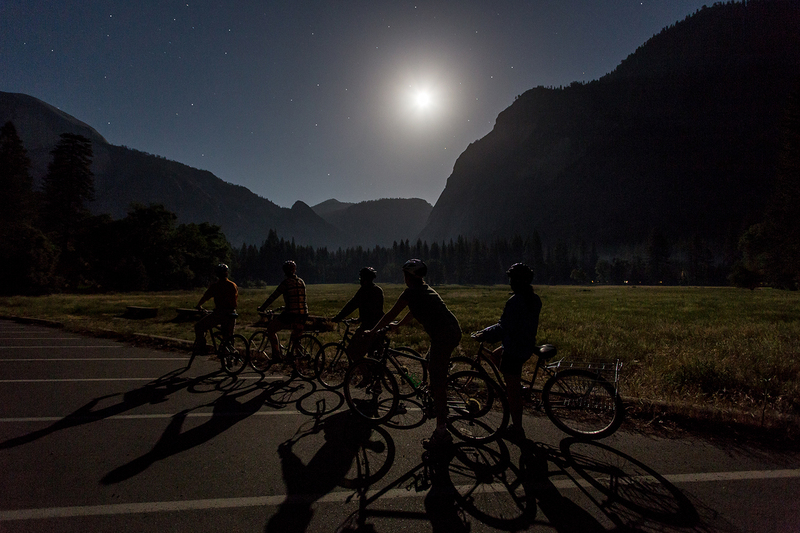 In addition to ranger programs, DNC Parks & Resorts at Yosemite offers Stargazing Tours to Glacier Point, Full Moon Bike Rides in Yosemite Valley and the “Starry Skies” program that takes place in the meadows of Yosemite Valley. For the diners and socializers, you’ll find hospitality every evening at The Ahwahnee Dining Room and bar and the Yosemite Lodge at the Falls Mountain Room Restaurant and Lounge, including evening presentations about the natural and cultural history of Yosemite. Summer nights at the Curry Village Pizza Deck & Bar are a park visitor tradition. In Yosemite Village you can experience live theater presented by the Yosemite Conservancy, with topics ranging from historic figures to daring adventures. At the Wawona Hotel, you’ll find dinner and entertainment in the form of vintage Yosemite songs played by pianist and storyteller Tom Bopp. Glacier Point Star Party in Yosemite. 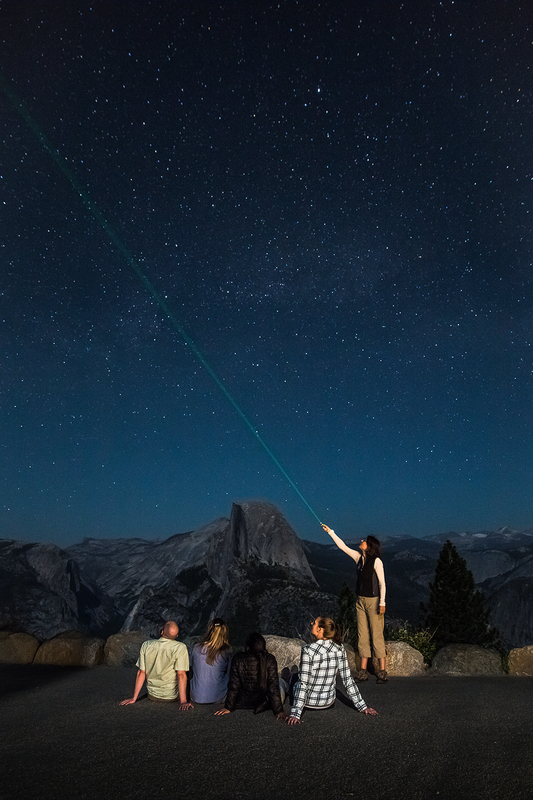 Yosemite fun and activity after dark doesn’t stop when summer has ended. As the days grow shorter in fall and winter, there is plenty of time for evening fun with fireside storytelling and Yosemite’s Signature Food and Wine events at The Ahwahnee. Vintners’ Holidays in the fall, the Bracebridge Dinner during the holiday season and Chefs’ Holidays during the winter include lodging and dinner packages to maximize your culinary experience. Vintners’ Holidays features prominent winemakers showcasing their vintages. Bracebridge Dinner transforms the dining room into a 18th century English manor for a feast of food, song and mirth. Chefs’ Holidays provides a cooking adventure showcasing the range of styles, personalities and trends that characterize the American culinary scene. Besides a winter’s eve filled with food and wine, you can also stay active after dark at the Curry Village Ice Rink with evening ice skating sessions and participate in a snowshoe walk under the light of the full moon at Badger Pass Ski Area. 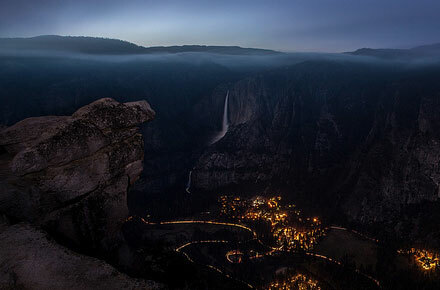 No matter the season, there are wondrous things to see and do after dark in Yosemite National Park. 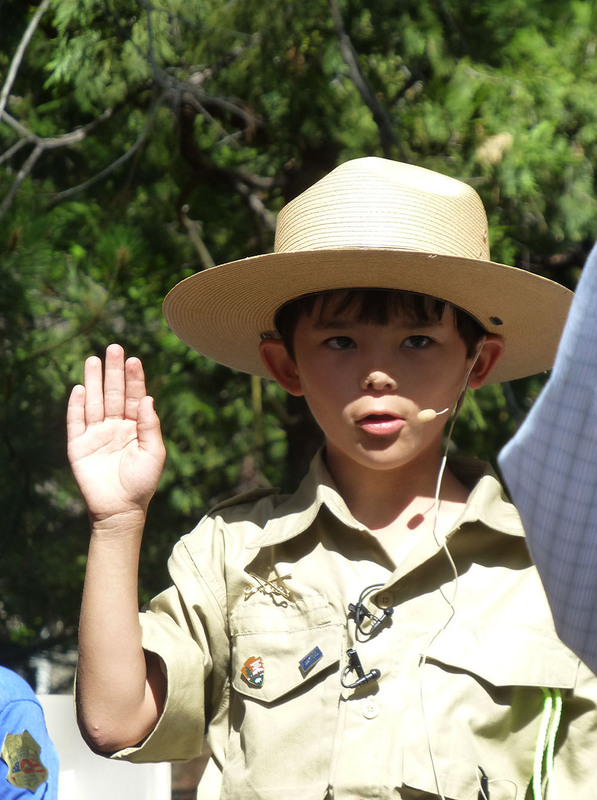 Ranger Gabriel is sworn in at Yosemite National Park. Photo by Michelle Hansen. Gabriel Lavan-Ying, an eight-year-old from Gainesville Florida suffering from Ehler’s Danlos Syndrome, wished to become a national park ranger. 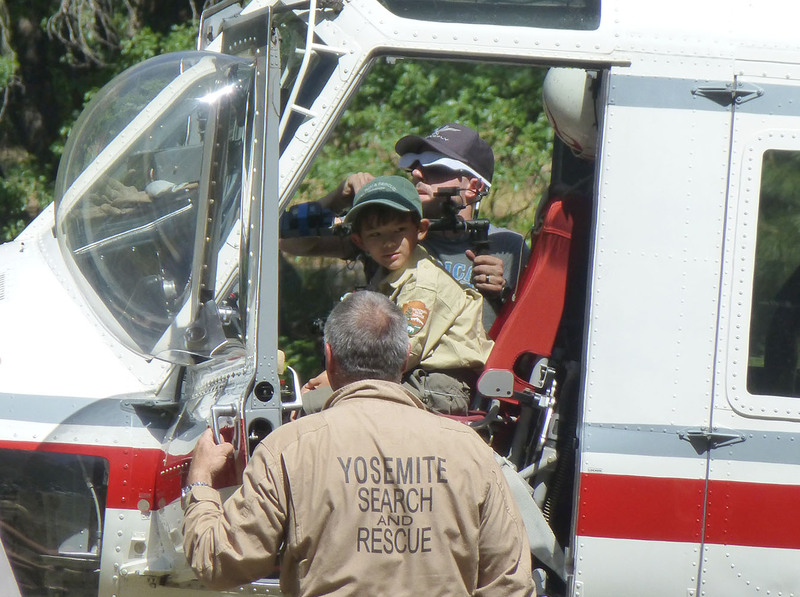 With the help of Make-A-Wish Central California, Yosemite National Park endeavored to make Gabriel’s wish come true on Tuesday June 3, 2014. Make-A-Wish Central California grants the wishes of children between the ages of 2½ and 18 who currently have a life-threatening medical condition which is defined as a progressive, degenerative or malignant and has placed the child’s life in jeopardy. Gabriel wanted “to see cool stuff like waterfalls”, and he is a history buff who loves nature. 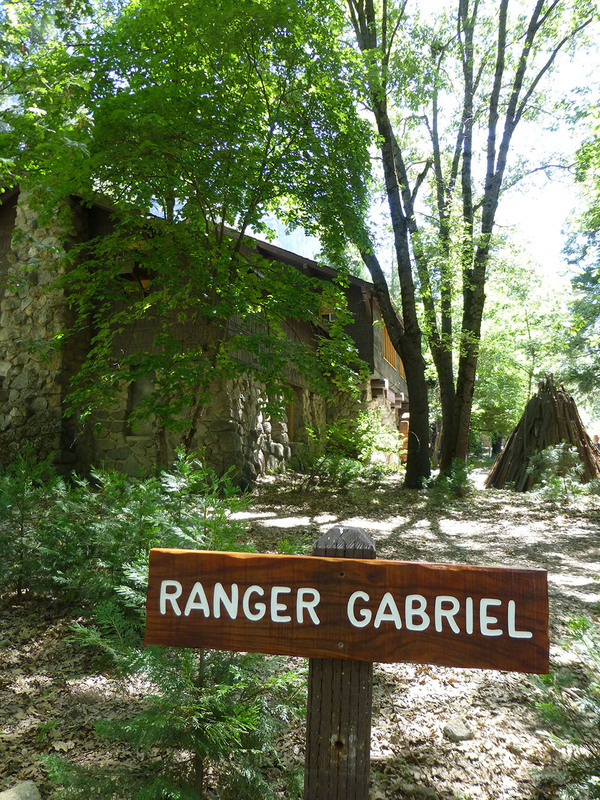 So the rangers at Yosemite National Park put Gabriel through extensive training in order to ensure his success as a national park ranger. Gabriel arrived in Yosemite with his family – mother Tara, father Kon, twin sister Angelica and older brother Dominic – and stayed at Tenaya Lodge just outside the south gate of the park. On Tuesday, Gabriel and his family traveled to Yosemite Valley for his training and swearing-in ceremony. 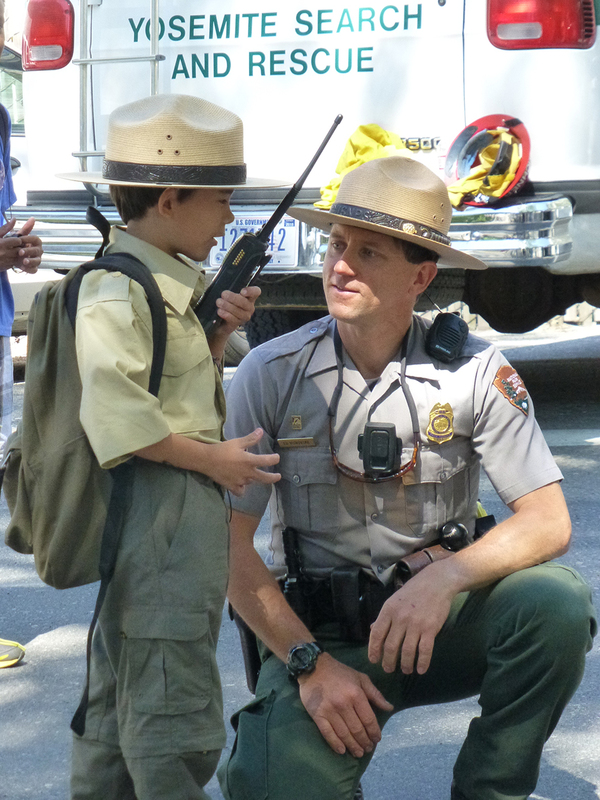 Ranger Gabriel learns to use the radio before boarding the NPS firetruck. Photo by Michelle Hansen. Gabriel was dispatched to fight a wildland fire with the Yosemite Fire Crew, attended naturalist walks in Cook’s Meadow, was also dispatched to a search and rescue operation involving an injured hiker and assisted the Yosemite medical team in transporting the patient to a rescue helicopter. After Gabriel’s full day of training, he was sworn in as an Honorary Park Ranger in a ceremony at the Yosemite Valley Visitor Center. Approximately 300 people, including Yosemite community members and Yosemite park rangers, witnessed the ceremony in which Gabriel received his badge and credentials. United States Magistrate Judge Michael Seng and Yosemite National Park Superintendent Don Neubacher presided over the ceremony where Ranger Gabriel also received a flag that was previously flown over Yosemite National Park. 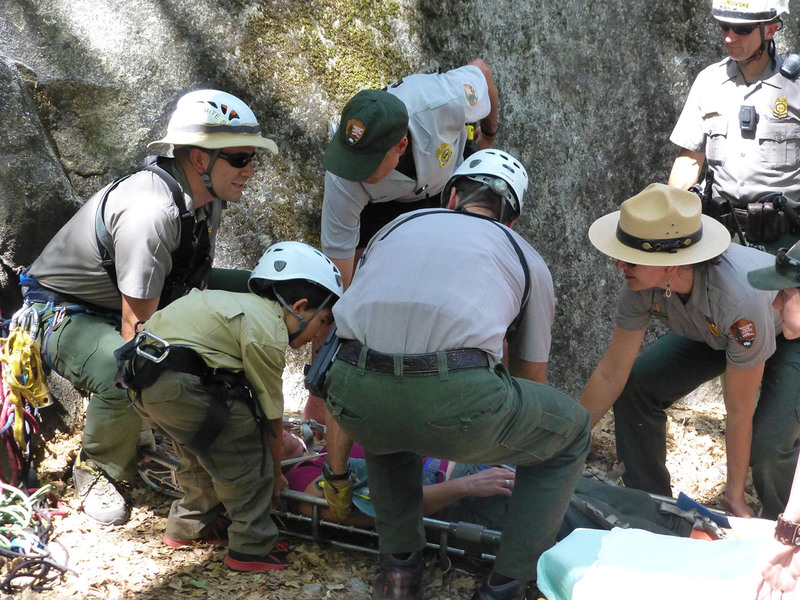 Ranger Gabriel assists with the rescue of an ‘injured’ hiker. Photo by Michelle Hansen. Ranger Gabriel assists with transport to the search and rescue helicopter. Photo by Michelle Hansen. 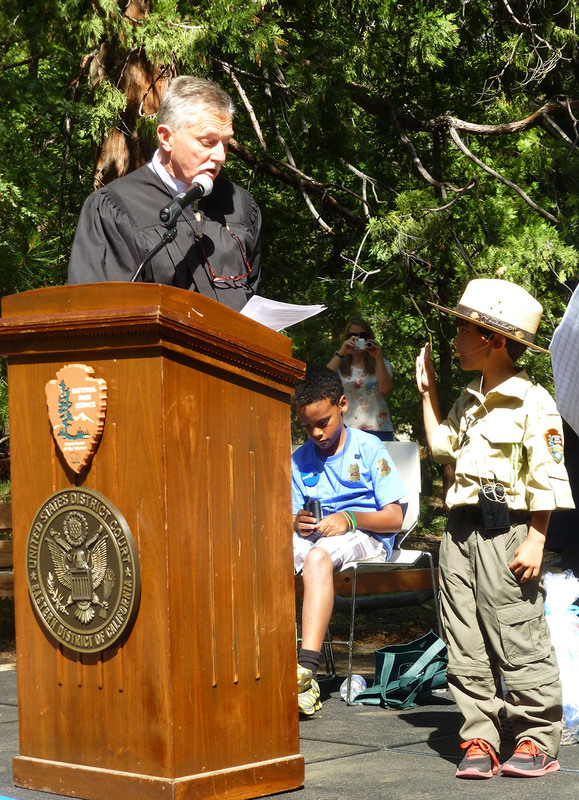 Ranger Gabriel is sworn in as an Honorary Park Ranger by Judge Michael Seng. Photo by Michelle Hansen. In addition to the training, DNC Parks & Resorts at Yosemite provided some down time in the form of a pizza party at Degnan’s Loft in Yosemite Village. Ranger Gabriel relaxed at lunch with his family, the NPS rangers involved in his training and the Make-A-Wish crew. After the ceremony, The Ahwahnee kitchen staff celebrated Ranger Gabriel’s new status with a congratulatory cake created by Executive Pastry Chef Paul Padua. On the shaded back patio at The Ahwahnee, Ranger Gabriel wrapped up his first day as a Yosemite park ranger, sharing cake and lemonade with his family and dozens of his new friends. Returning the next day to Yosemite Valley, Ranger Gabriel escorted his family on a rafting trip down the Merced River, ever vigilant for those that may need the assistance or knowledge of a national park ranger. 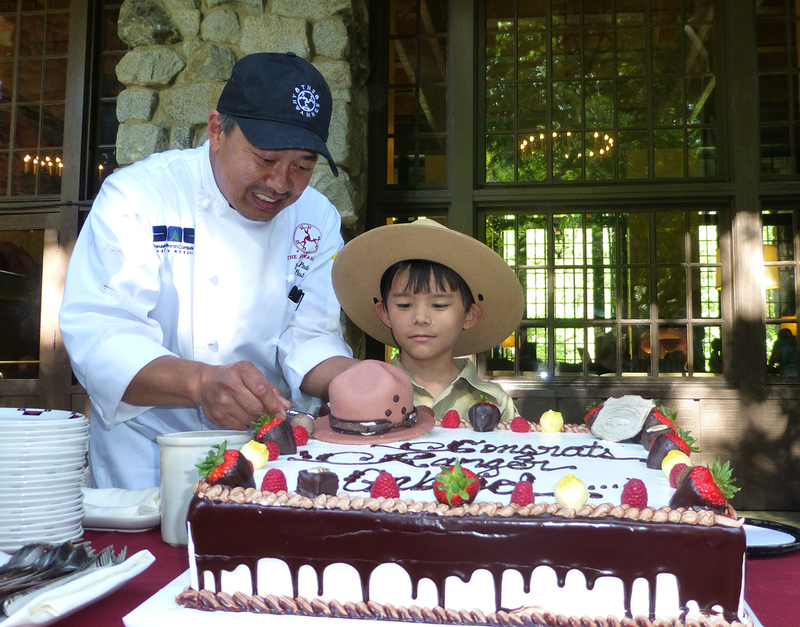 Chef Paul Padua helps Ranger Gabriel cut the cake at The Ahwahnee. Photo by Michelle Hansen. 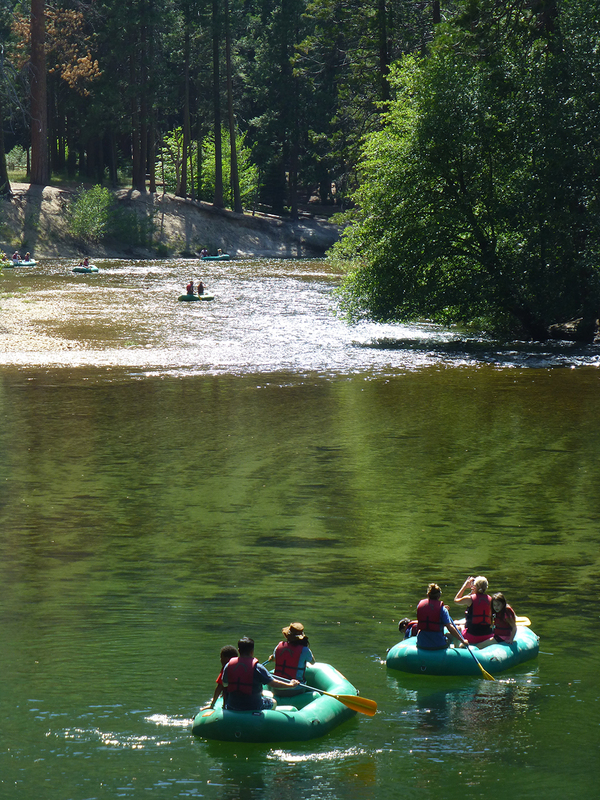 Ranger Gabriel and family rafting the Merced River in Yosemite Valley. Photo by Michelle Hansen. Ranger Gabriel’s parking spot in Yosemite Valley. Photo by Michelle Hansen. Part of Yosemite’s appeal is the accessibility of its grand vistas and enormous cliffs. You don’t have to hike for miles to be sprayed by the mist of a waterfall that is hundreds of feet high. Short paved paths lead to many amazing sites making them both stroller and wheelchair-friendly. 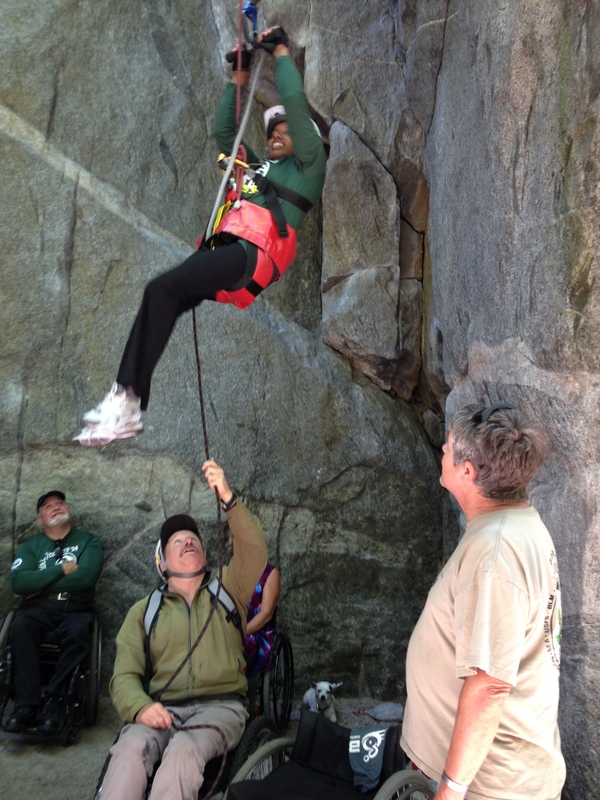 The Rock ‘n Roll Yosemite camp run by Access Leisure visited the park for the 8th straight year. 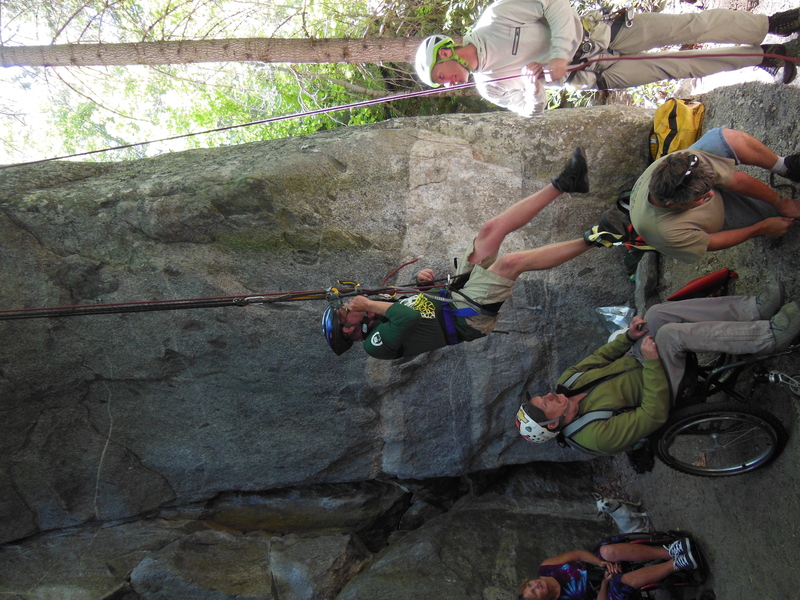 From May 14 – 17 participants explored Yosemite Valley by hand cycle and exposed themselves to the thrill of rock climbing during an Adaptive Rock Climbing Session organized by Mark Wellman of No Limits, and with the help of Yosemite Mountaineering School climbing guides. 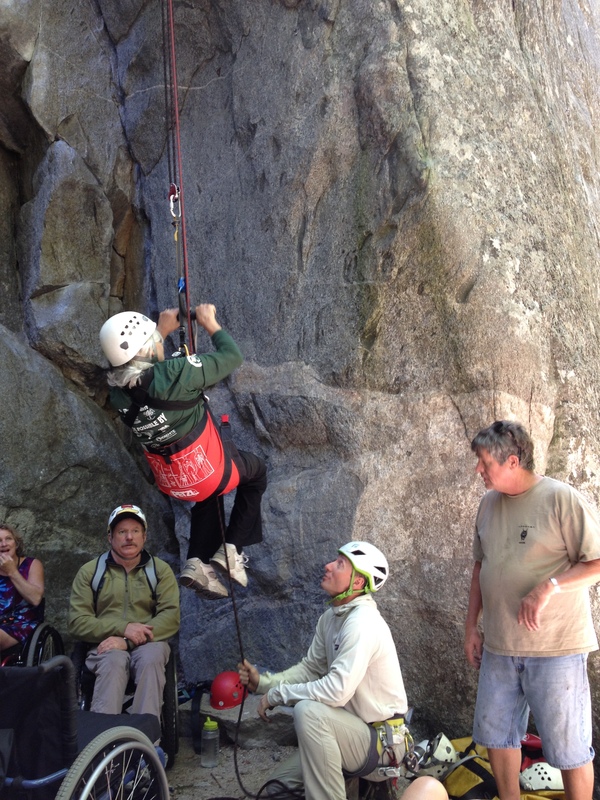 Climber Sheryl Cooley sets out under the watchful eye of Mark Wellman and a Yosemite Mountaineering School guide. Climber Abeba Benton is strong enough that she doesn’t need the 3:1 mechanical advantage, simply executing dozens of pull-ups to reach the top. Jim Davis takes advantage of his strong right arm and an ascender on his right foot to climb to the top. By Presidential Proclamation, the first of May each year is set aside to encourage Americans to recognize and appreciate the importance of the rule of law in America. 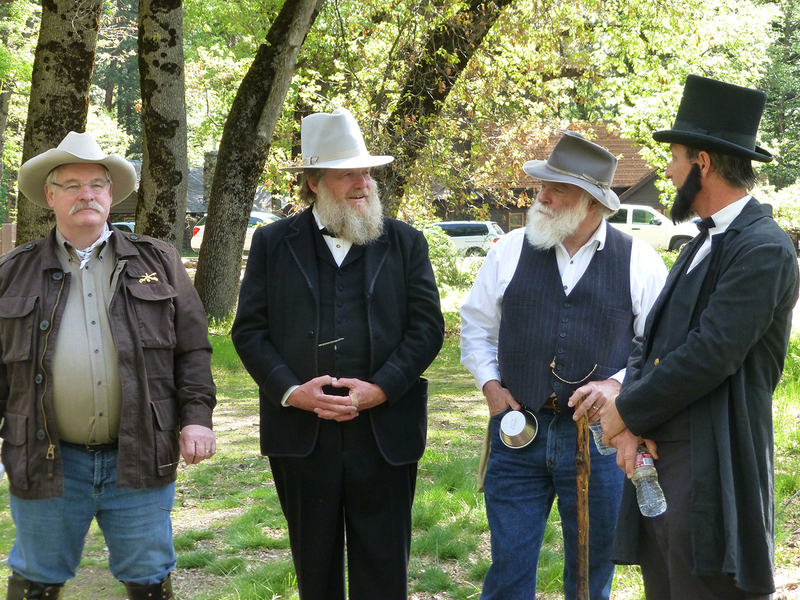 On May 2nd this year, the U.S. District Court and the San Joaquin Valley Chapter of the Federal Bar Association sponsored the second annual Law Day Yosemite commemoration at the Yosemite Valley School with a focus on the 150th anniversary of the Yosemite Grant Act of 1864. 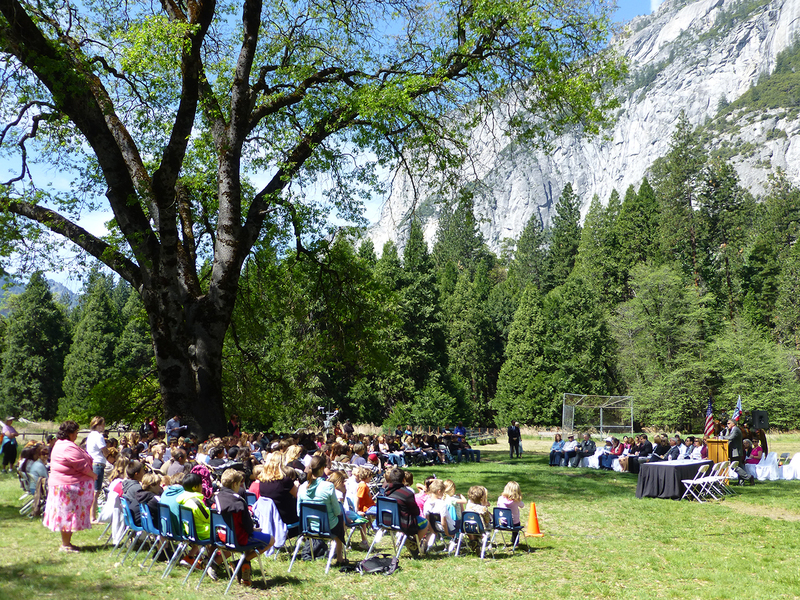 The 2014 Law Day Yosemite commemoration hosted an essay contest open to local 8th grade students at El Portal, Groveland, Lee Vining, Mariposa, Lake Don Pedro, Wasuma, Wawona, Woodland, and Yosemite Elementary Schools and Oak Creek Intermediate School. 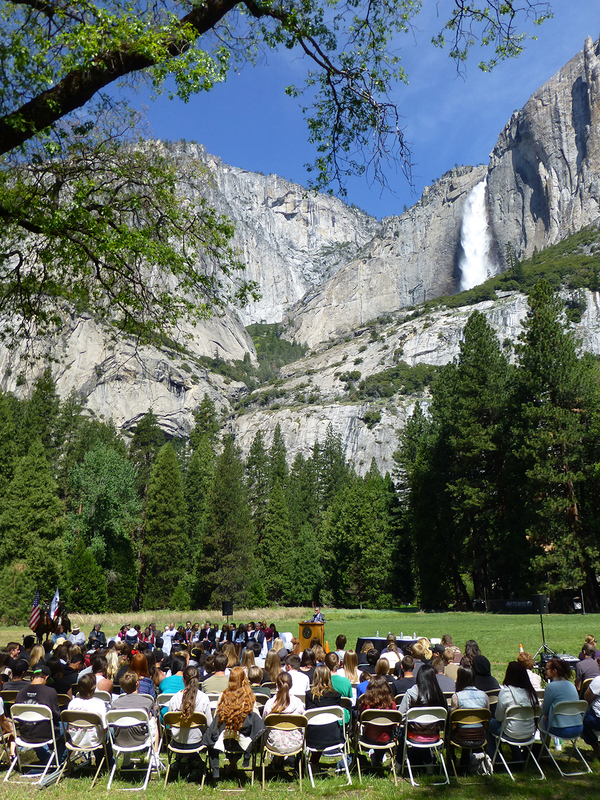 Approximately 250 eighth grade students from these Yosemite area schools gathered at the foot of majestic Yosemite Falls to celebrate the Rule of Law and its contributions to the rights and freedoms of all Americans. This year’s commemoration emphasized the role of the rule of law in preserving and protecting our national parks. President Abraham Lincoln, Conservationist John Muir, Yosemite’s First Guardian Galen Clark and President Teddy Roosevelt made an appearance to discuss with students their respective roles in creating and protecting Yosemite National Park. Yosemite’s Law Day commemoration coincides with the celebration of the 150th anniversary of the Yosemite Land Grant Act of 1864. President Abraham Lincoln, in the midst of the Civil War, had the vision to sign an act which established Yosemite Valley and Mariposa Grove as the first public lands to be protected and preserved for the citizens of the United States for all time. Students were invited to submit essays describing the significance of the Grant Act of 1864; why legislation was necessary to protect places like Yosemite Valley; what Yosemite might have become without such protections; whether and why national parks are important to America; and, how we might inspire future generations to support the idea born of the Yosemite Grant Act. Winners of the essay contest were announced and awards presented at the event. Law Day Yosemite 2014 is a collaborative effort of the United States District Court in Yosemite, the San Joaquin Valley Chapter of the Federal Bar Association, the National Park Service and DNC Parks & Resorts at Yosemite. The event is funded by the United States District Court for Eastern District of California and the Federal Bar Association Foundation. The public is invited and encouraged to attend and show support for the concept and for rural school students who may not have the opportunity to attend city events.